All is never as it seems. Chinese folklore has large tomes filled with proverbs and eight-character couplets to drive this point home. 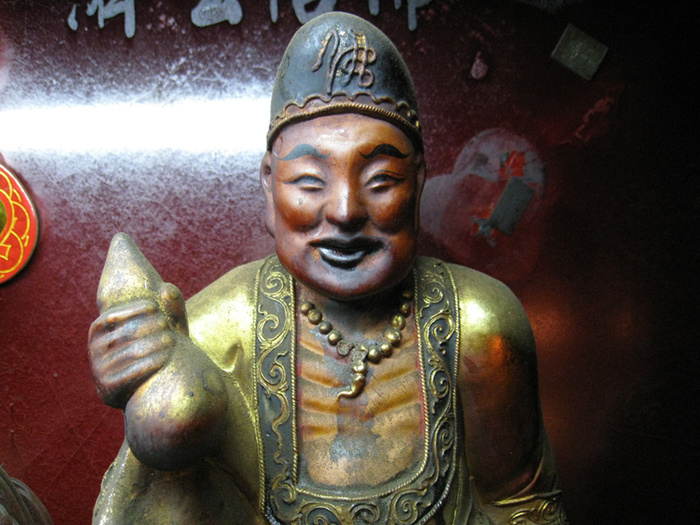 Many of those proverbs and couplets revolve around the character of Ji Gong, the ragged monk with the silly grin and a half-full wine gourd in his hand. We’ve taken a few looks at the wild monks of Shaolin, both at home and abroad, and we have also explored a great mystery surrounding Jar Jar Binks, a very silly Star Wars character who may turn out to be the greatest Sith Lord ever. Now let’s spend some time with one of their spiritual forefathers, the Song Dynasty prodigy-turned-hobo Daoji, known as Ji Gong, and a few of the legends he spawned. Ji Gong was once known as Liu Xiuyuan, a real person born to a real official more than one thousand years ago during the glorious Chinese dynasty that would eventually fall to Kublai Khan after decades of protracted warfare. Xiuyuan was born in the years just before the invasion, when the Song just passed the height of their power and the cities of Hangzhou and Suzhou were without a doubt the greatest cities of their time. Liu Xiuyuan entered Hangzhou when he was 18 and became a monk at Ling Yin Temple, a sprawling Buddhist temple still perched on the hills surrounding the West Lake of Hangzhou. The temple is an ode to the Chinese Buddha, fat and laughing, with gold rings in his ears and sacks full of goodies at his feet. But he was blessed by the Buddha and proved it through a long list of miracles and magical acts. 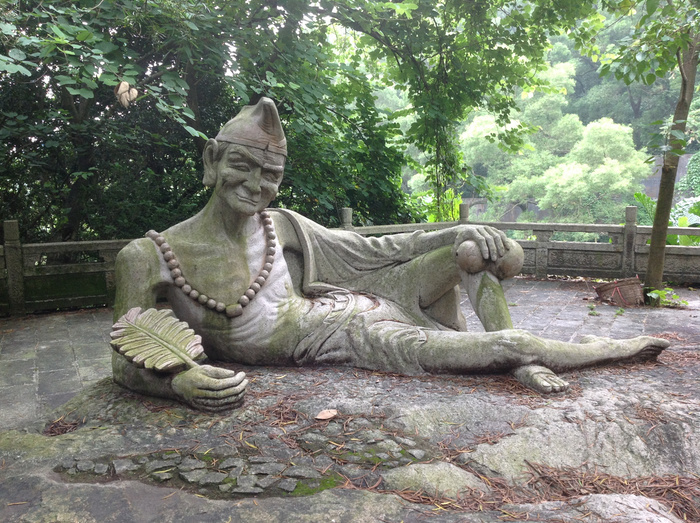 The people began to love him, follow him around, and spread the stories of the wild, drunken master who had the Buddha in his heart and the people on his mind. There was the time he saved a village from a landslide by kidnapping the bride and forcing the whole village to chase him down the mountain. When the landslide hit, one stray boulder rumbled down toward the congregation. Daoji stepped up, wine flask in his right hand, and delivered a Buddha Palm strike that stopped the boulder in its tracks. The offending boulder lies there still to this day, on the path toward Ling Yin Temple, with a thousand year old palm print indented on one side. Or the many times he asked poor craftsmen for minor objects—a fan, a pair of shoes—and instead of paying the small fee, Daoji left behind a pile of golden coins. There are a few such characters in Chinese history who leave their temporal origins and become folk heroes, seeping into every facet of the culture. Daoji is not only a minor deity in Chinese Buddhism, and a source of many teachings or koans, but he is also a Taoist god and oracle. Syncretic Taoism—the type of Taoism unconcerned with orthodoxy and more concerned with the righteous and beautiful wherever it may crop up—is the quintessential Chinese belief system. Flexible and absorbing, vague in terms of rules but very clear in terms of the one true goal: Walking in accordance with the Way. For martial artists, who also have a bit of the syncretic about them, Ji Gong represents both the essence of what it means to be a good person in this varied world, but also a very important concept when it comes to combat: nothing is as it seems. A true master could come clothed in rags, silly and singing, but be the only one in the room who holds the Buddha in his heart.